Diaphragm pressure gauges are considered as specialists in the process industries. They come into play when Bourdon tube pressure gauges reach the limits of their performance. One of the advantages of diaphragm pressure gauges is the measurement of low pressures. Diaphragm pressure gauges can be recognised from the first look: From the flanges below the case, between which the elastic pressure element – the diaphragm element – is clamped. These instruments can measure pressures from as low as 16 mbar, with the maximum value at around 25 bar (for comparison: Bourdon tube gauges reach their lowest physically possible measured value at 600 mbar). The larger the diaphragm element, the lower the measurable pressure is, in accordance with the formula – pressure = force / area. WIKA uses two diaphragm sizes: with a diameter of 134.5 mm for the measuring ranges of 0 …16 mbar up to 0 … 250 mbar and a diameter of 76.5 mm for the measuring ranges of 0 … 400 mbar up to 0…25 bar. 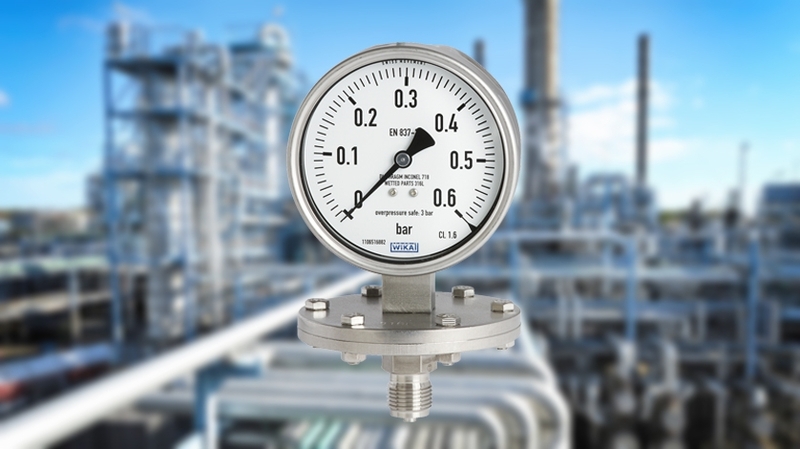 With pressures under 16 mbar, diaphragm pressure gauges hit their limits. For this case, their diaphragms would have to be exceptionally thin in order to achieve the required elasticity. Then, however, they would no longer remain reliably stable. This problem can be solved, though, with a special variation of the diaphragm pressure gauge: the capsule pressure gauge. Capsule elements consist of two diaphragms welded together, which are generally loaded with pressure from the inside. This results in a double diaphragm travel. In this way, even the lowest of pressures can be measured without reducing the wall thickness. However, since the pressure chamber is not self-draining, capsule elements are not suitable for applications with liquid media. You can find further information on diaphragm pressure gauges on the WIKA website under the headings Pressure gauges and Pressure gauges with output signal.